Learning to stand up for yourself is a process. Embracing that you are worth so much Love, you begin to realize that all of the Love You Give Out - is the same that you should start giving yourself. 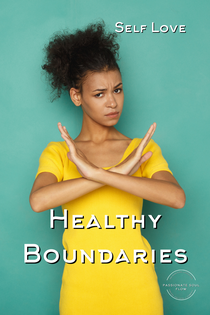 Healthy Boundaries come into play when people or situations come into your field, reflecting old patterns. Because you are now fully aware of, feel and radiate your beautiful worth, there may be times where you find yourself saying, ‘No, I don’t accept that anymore.’ May it be types of people in your field, the type of work you accept into your life, or the kinds of lovers and partners you embrace into your experience. We can often go through a lifetime of accepting that life happens a certain way, because we grew up with it that way and have become accustomed to it. We become so used to it that we forget that there are Other Ways. Happier ways! Our Inner Self Worth is becoming stronger in the realization that everything we believe other wonderful people should have - we are also deserving of. All the Goodness of Life we also very much deserve. This also means that our Healthy Boundaries become our ‘feelers’ for situations and people who are Vibing somewhere other than what is wonderful, beautiful, magnificent, and joyful for our experience. Our ‘feelers’ begin to lead us into other experiences, and if not yet, then we might be at the point where the old ways are ceasing to affect us. So many of us are working on Self Love and Self Worth. I Deserve to be Happy, Cherished, Respected, Loved, have my needs met, and live a Joyful Life. I give that to myself Now. When we’ve come to a point where our Inner Fire is stimulated towards our wellbeing and happiness....all other versions (older versions) begin to fall away - no longer being attracted into our field. And then it’s time for us to stay focused. Focused on our happiness. Focused on accepting happy and joyful situations and experiences into our lives. Because sometimes those ‘old patterns’ try to present themselves again, like a test, seeing if you’re really standing in your new Inner Power. It’s okay if every once in a while you find yourself feeling the same emotions as before. Like an old habit, you’re going to train yourself to allow yourself to experience New Awesomeness! Pull that Inner Smile Up from beyond your Belly and into Your Heart. That will stimulate your Fire, bringing it up into your Love Center!